With the growing demand to innovate, America currently endures a STEM workforce shortage. Organizations across various industries struggle to fill skilled positions. Despite a national focus on STEM over the past decade, it’s projected that there will be 3.5 million STEM jobs in the U.S. by 2025, and 2 million of those jobs will go unfilled. Compounding this dilemma, there are not enough skilled workers to fill this void in today’s current climate. Shifting labor needs have resulted due to technology advancements. Thus, creating a non-negotiable demand for skilled STEM professionals. Job growth in information technology and emerging technologies are generating more business and the development of new STEM roles. The future of the STEM talent landscape is still somewhat obscure. Talent professionals are informed about today’s current climate and demand, but the jobs and skillsets of tomorrow are still a mystery due to rising technology and the rapid pace of innovation. In fact, data suggests that 65 percent of elementary school students today will participate in a future workforce with jobs that haven’t been invented yet. Market drivers motivating this revolution include the Internet of Things, artificial intelligence, machine learning, augmented and virtual reality and blockchain. Alongside these emerging technologies, the physical location of skilled professionals further complicate the STEM talent gap. While the demand for STEM professionals continues to grow, another dilemma presents itself—much of the STEM talent exists outside the United States. 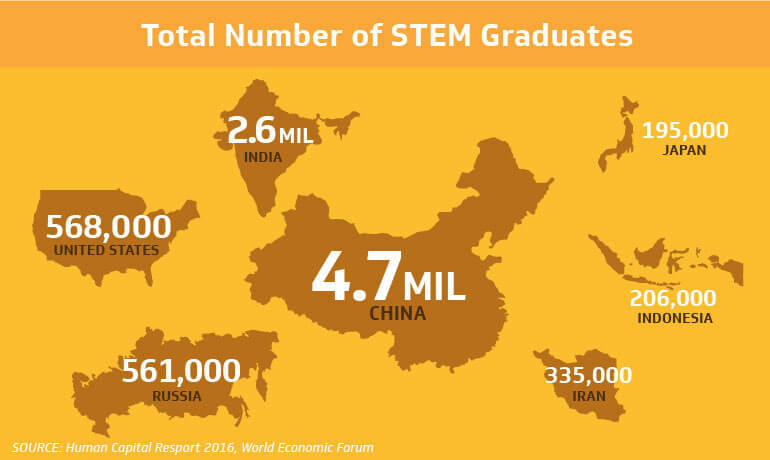 In recent years, the nation fell in ranks to third place in the global production of STEM graduates, following behind China and India. 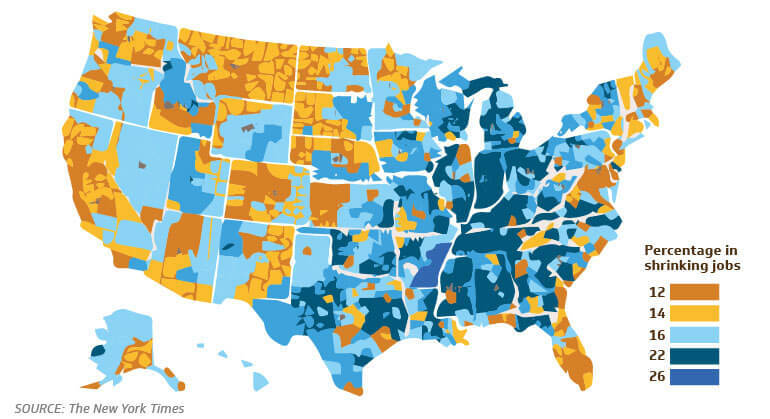 Domestically, geography also presents an additional challenge to STEM jobs. Economics, policy and local geography factors play a significant role. Geographic barriers also pose an issue of job access within areas of surplus STEM jobs. Many hubs of STEM jobs are physically further away from qualified job seekers, resulting in a need to import skilled talent from other regions despite having a local populace. This equity dilemma is caused by lack of opportunity to undeserved communities fueled by poverty and place, undermining the fulfillment of a skilled workforce. Job growth continues to concentrate in urban and metropolitan areas on U.S. coasts as post-secondary requirements for jobs, such as a bachelor’s degree, rise in trend. Alongside this trend, jobs are projected to steadily shrink across the Midwest and South regions by 2026, areas which have been widely affected by automation, globalization, labor outsourcing and industry departure. Geographic barriers aren’t the only barrier to jobs in the STEM Talent landscape—the production of an educated STEM workforce also drives the current talent crisis. STEM education has never been more critical. Our ever-changing world calls for a generation of STEM professionals to innovate and tackle the next wave of problems. Modernization of our society has provided a requirement for post-secondary education. However, not enough students are earning bachelor's, master's and doctorate degrees. This dilemma adds to the growing STEM talent gap as most STEM occupations have higher education requirements. America also is not currently producing enough STEM graduates. In fact, during 2014 and 2015, the U.S. added 230,246 STEM jobs. Yet, only 30,835 STEM graduates entered the workforce, according to the 2016 U.S. News/Raytheon STEM Index. There is also a lack of quality candidates stemming from a disconnect between employers and post-secondary institutions, STEMconnector reports. Schools are struggling to develop a proper curriculum to address employer needs and the transformative labor market. Within secondary education, a belief gap also hinders education by decreasing interest among younger generations. Young students widely believe that if they are inadequate in STEM concepts, that the field of study is not for them. Sadly, teachers and students often reinforce these beliefs. Moreover, interest levels differ in science, technology, engineering, and math subjects among K-12 students based on gender, further suggesting negative, cultural stereotypes about women and men’s roles in the labor force. These three drivers forming the talent landscape create a workforce challenge for employers, opportunity gaps for prospective job seekers and an enrollment issue for educators. Addressing the current STEM talent shortage will require cross-functional efforts from all levels, including private, federal, policy makers and society at large.